Silver was once thought more precious than gold. It is referred to as metal of Moon and some believe it has powers over emotions, the psychic mind , love and healing. Pure silver melts at 1761 degrees and sterling at 1640 degrees. Silver is a chemical element with symbol Ag . It has highest electrical and thermal conductivity. It is us in Coins,Jewelry,Tabeware and Photography. SILVER - HISTORY : Silver (Ag) is known since 4th millennium BCE. It has been used for ornaments and utensils , trade ,for monetary systems.Its value is second to Gold. OCCURRENCE : The principal sources are copper, copper-nickel, gold , lead obtained from Canada, Ontario , Mexico, Peru, Australia and U.S. Mexico is largest silver producer.It produced 80,120,000 troy ounces in 2000 , about 15% of annual production of world. In Ayurvedic System pure metals in precise combinations are used to restore body's electromagnetic balance.Medically , silver was known to be a liver and spleen detoxifier. Disease organisms cannot live in the presence of even minute traces of Silver. Silver minimizes the growth of plaque in the mouth. There is also subtle electromagnetic event that happens when you connect your two hands with your tongue via the silver, but this is a bit esoteric for now. Non-toxic and anti-biotic: It is non-toxic to humans but toxic to fungi, bacteria, protozoa, parasites. Silver removes bacteria better than other materials. It is good for preventing sore throats, influenza, etc. 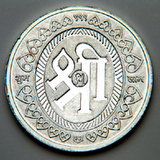 Energetic balancing :	Also, there is an electronic component in connecting your tongue and two hands with Silver. This is more esoteric, but a good reason, nonetheless. Beautiful: It is good to surround your self with beauty and these Silver Tongue cleaners are works of Art handmade by a Jeweller. In addition to internal liquid refreshment, skin requires external water replenishing. This is where moisturizers can be extremely effective. Moisturizers (also called humectants) attract moisture to the skin's surface and hold it there. Younger skin only needs light moistuizing whereas older skin needs specific nourishing treatments. A vast array of natural moisturizers are available. 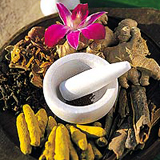 Every Ayurvedic physician has formulated his/her own special recipe. Ours is the a tridoshic formula developed by vaidya Scott Gerson, M.D., Ph.D. Scholar (Ayu). Its main ingredients are listed below (but not the actual recipe!). The metal, mineral and gemstone ingredients (i.e. gold, silver, pearl ash) used in these formulas are genuine and are the key to their effectiveness. They are prepared using traditional Ayurvedic rasashastra methods. Silver is used for the purification of water and food. Water boiled in a silver utensil remains healthy and pure for a longer period of time. Similarly if a silver bowl contains poisonous food its colour changes to blueish - black. Kings and royal families used to drink water in silver containers, thus the use of silver in our culture is dated back to hundreds of years. And probably this is the reason why we still have atleast one silver utensil in our kitchen today like a glass, ghee container, etc. Electrical and Electronic products have printed circuits which are made of silver paints and computer keyboard's use silver electrical contacts. In Mirrors silver is used as a reflecting material, the process is called silvering. 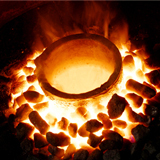 The metal is chosen for its beauty in manufacture of jewelery and silverware. It is useful as dental alloys for fittings and fillings. Silver oxide is used as positive electrode in watch batteries. Silver ornaments/utensils when not in use , turn blueish-black due pollution /humidity. Do not misinterpret that silver is of low quality. Silver articles can be cleaned using Colgate tooth powder or potato skin. Add Ammonia and household detergent powder in hot water and wash silver utensils with it. 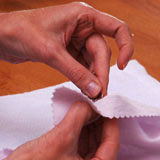 Pat it dry with a muslin cloth. Marks formed due to rubber bands cannot be cleaned easily, hence avoid contavt with rubber for a long period of time.